Back in 2017, Hope Technology launched its first ever bike, the HB160. 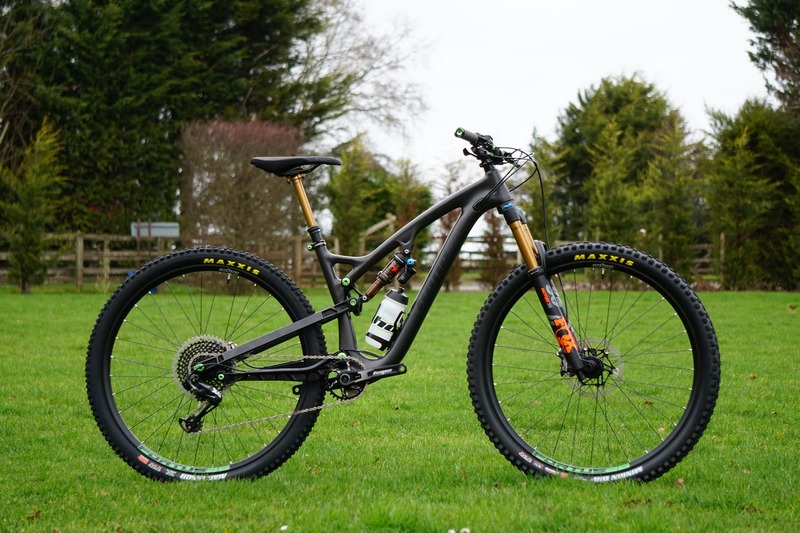 With an eye on racing top level EWS events the HB160 was a big travel pure enduro bike. 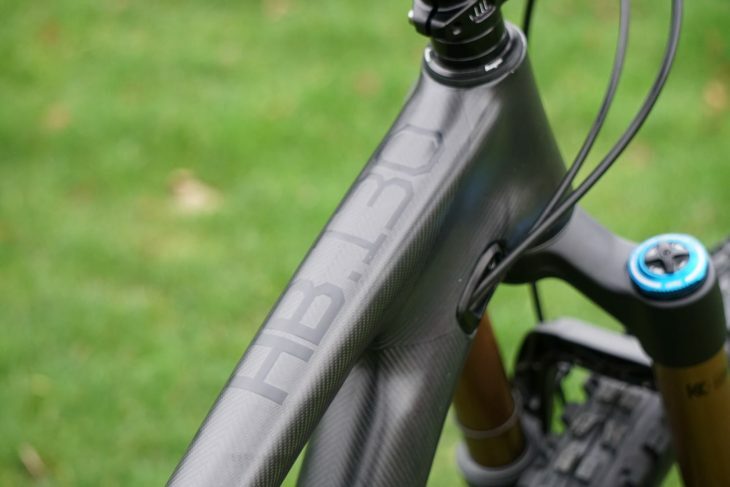 Fast forward to 2019 and lurking in plain sight on the Hope stand at Core Bike was the brand new HB130. The HB.130 represents a shift in focus for the Hope bike. 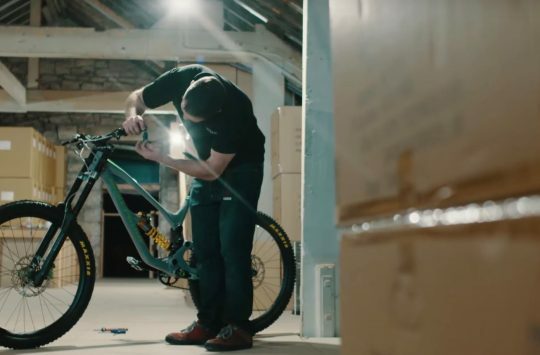 Along with the news of no more EWS team that was announced last week, the HB.130 is a bike designed for day to day UK riding rather than competing on the world stage – a bike as capable on the ups as on the downs, from all day epics to off piste ruts. The frame still features the same beautiful carbon finish and 130mm rear spacing as the HB.160, but that’s pretty much where the similarities end. Where the HB.160 was running 27.5in wheels, the HB.130 is based around bigger 29in wheels, and as the name suggests delivers 130mm of travel at both ends. 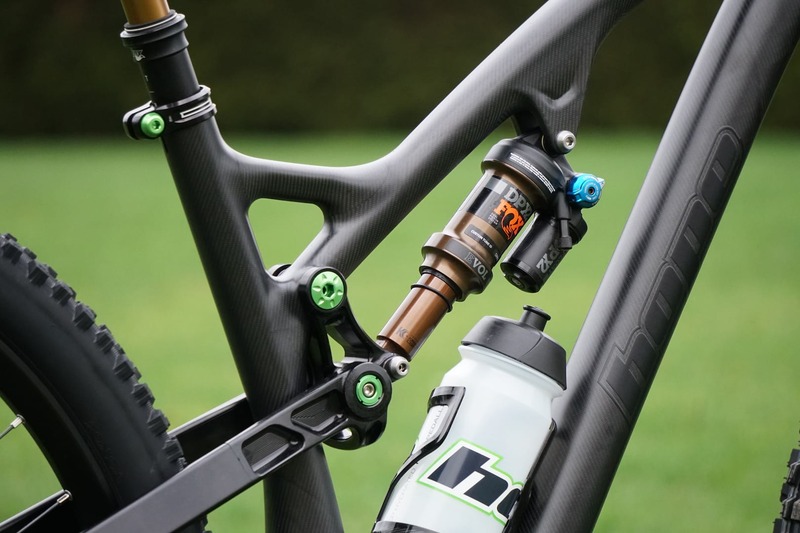 The shock mount position has also moved from the down tube to the top tube allowing Hope to utilise the newer metric shock sizes, along with enabling them to fit bottle mounts and for a full-size bottle. The bike will also feature Hope’s brand new Fortus wheelsets. Building on the success of their Tech rims, the new Fortus range has newly designed rim profiles for maximum strength to weight ratio and will be available in wheel sizes from 26in to 29in and in four different internal widths – 23mm, 26mm, 30mm and 35mm. Hope will also offer aftermarket decal kits for the wheels in six colours that match their anodising so you can get all matchy matchy if that’s your thing. And if you’d rather go down the custom build route, then Hope will be also be offering the HB.130 as a frame only option but with the addition of a 130mm spaced rear hub. 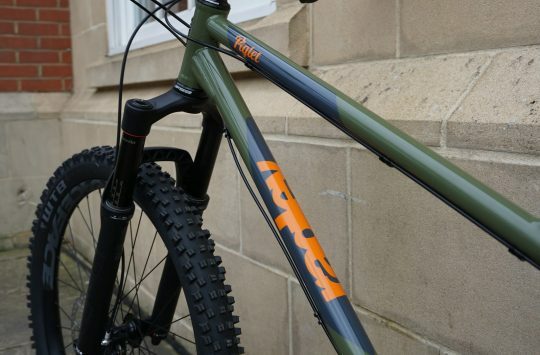 Although the HB.130 may be a step away from what the original 160 was designed for, Hope is still billing this as a bike capable of taking on the rough stuff, and as such you’ll be able to spec it with either a Fox 36 or 34 depending on your preferred style of riding, and both options will be paired with a factory DPX2 out back to deliver 130m of quality, adjustable bounce. 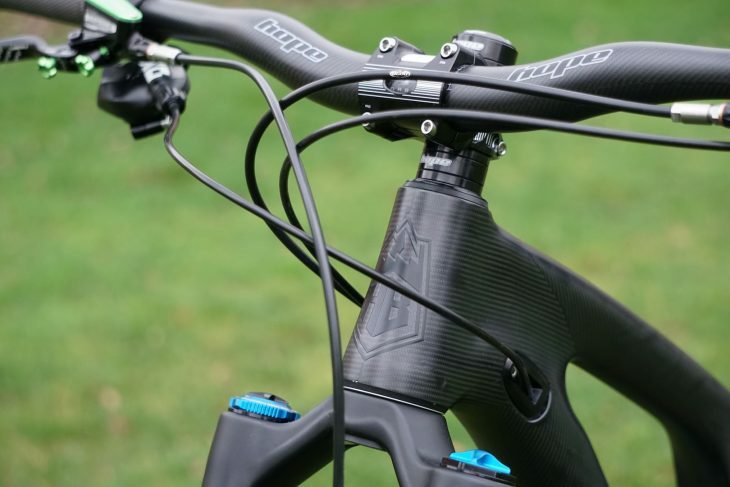 Although this is still a (late stage) prototype, the fact that Hope manufacture their own moulds in-house means they can make frame and geometry changes relatively quickly, so we’d expect the final bike to have a couple of geo tweaks. Hope is aiming to have the HB.130 available from your local Hope dealer by early summer so if it floats your boat then it’s time to start saving! So, what do you think of the HB.130… let us know in the comments below and if you have any questions we’ll try and get those answered for you. If this really is the case surely Hope would have offered a longer slacker HB160? They could continue with the existing HB160 moulds (if the existing geometry really is what they want to ride) and run a set of long slack moulds alongside. The fact that they haven’t done this suggests that even with Hope’s in house capabilities this isn’t as simple (or cheap) as you’re making out. 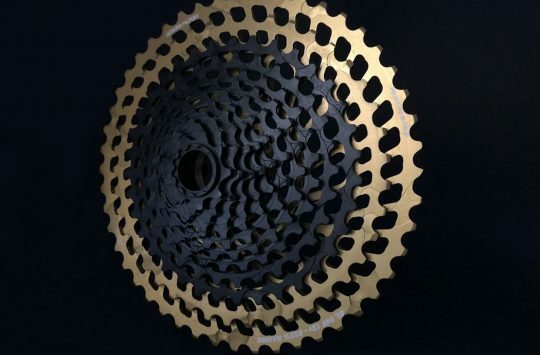 Can anyone explain the choice of 130mm rear hub? It’s not cheap to make the moulds – I was told about £8k each and loads of CNC hours, but relatively simple for a company with a factory full of CNC machines. But – the HB160 doesn’t really need to be longer and slacker. They ride really well as they are. “We produced a uniquely spaced rear end to achieve a dishless wheel build. Moving the drive-side chainstay out has altered the chainline to give more clearance around the bottom bracket (this was pre boost, but realistically has achieved the same thing). 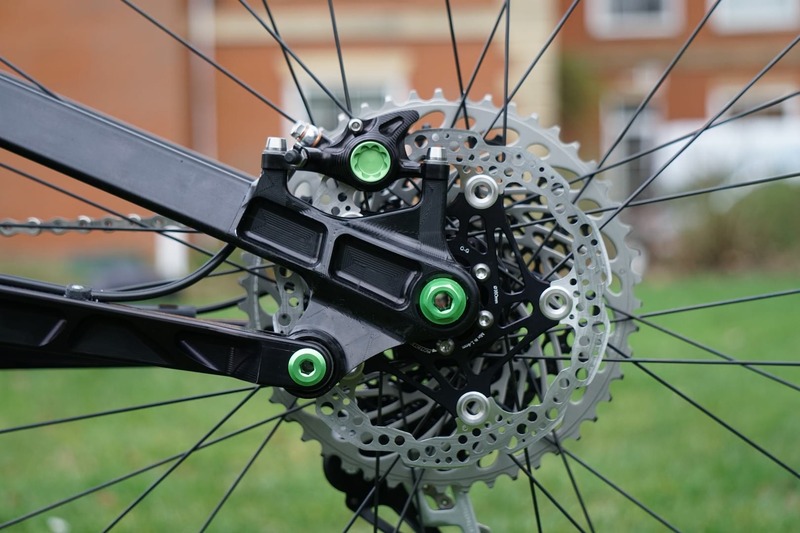 Additionally we brought the non-driveside chainstay in to create a narrower 130mm dropout width rear end and moved the rotor/caliper as close as possible to the spokes. Hi @edd – after chatting with the guys from Hope yesterday it does seem that they can relatively simply (for them!) make a new mould, as to whether or not it would be cheap I can’t comment. 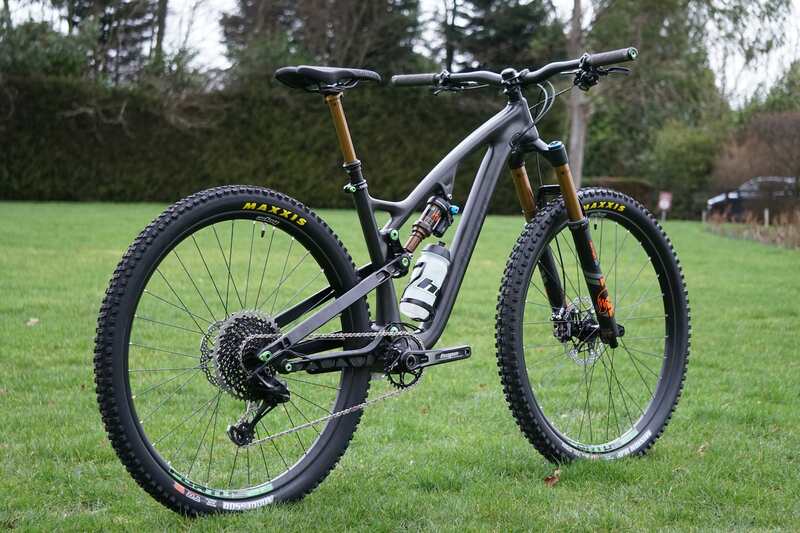 Likewise, I can’t comment on why / why not they would update the geometry of the 160 bike, but as mentioned in the story, this is not the first prototype for this bike and they already have another in production. In fact, almost as soon as this bike was completed a decision was made to steepen the seat angle suggesting that they can be fairly proactive in their prototyping / manufacture. Will they do a version for the over 65s? @singletrackross – fair enough, I guess I had been hoping that the HB.160 would be updated. Aa usual we have to have confidence in the great engineers at Hope to make a work of art, as they always have done previously. I e mailed them approx. a month ago asking them if they had a carbon hardtail in the works. Their rapid reply to me was no !!!!!….. singletrack magazine had got it wrong this time. 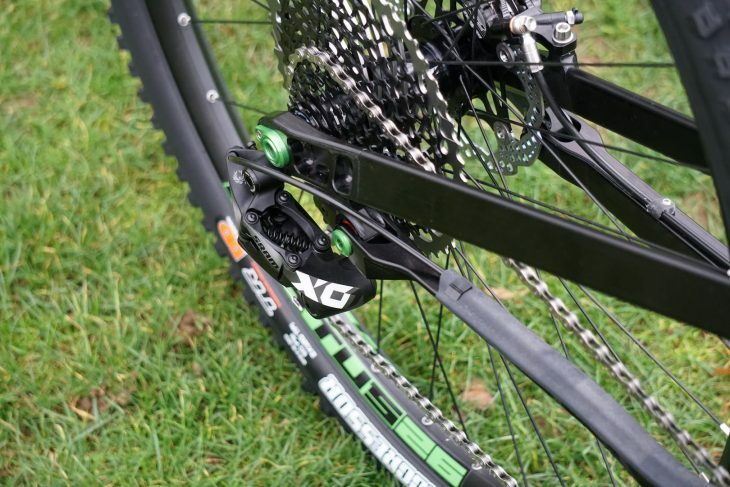 Any reason for ditching the radial rear brake mount? Less painful to scrap your one-off tooling (mould) now before you produce multiple sizes and possibly duplicates (depending on rate). Also possible they want to make tweaks to the proper production spec tools, eg how it closes, fillet radii, cure compensations etc. Production tooling may also be a harder wearing material. Development tools are good for training without risking your production tools so not money down the pan.